I was sitting at SFO recently, waiting for a connection down to Fresno, and had just finished a familiar conversation with a non-aviator who shared my row on United's 1290 out of EUG. It is not the first time I have had this particular conversation, nor will it be the last. The subject: Airspace. I was flying in one of United's 737s that offered ATC transmissions on cabin channel 9, and made a comment to the passenger next to me that it is cool to be able to listen to ATC en route. She had no idea you could do that, but slipped on the worn-but-free headset that United still crams into the seat pocket. I heard nothing from this woman until we landed. As we taxied to the gate, she removed her headset and was pretty much BLOWN AWAY having listened to ATC for the first time in her life. She turned to me and asked, seriously, "how DO they keep all those airplanes from crashing into each other?" It was the opening I was looking for. "Inside a certain boundary surrounding large metro areas, all aircraft – regardless of size – are talking to the same air traffic controllers," I said, "so lesson #1 is that nobody flies in the San Francisco Class Bravo airspace without permission. SFO airspace is a positive control area, meaning every airplane is being told what to do and where to go. But the really important thing to remember is that a Piper Cherokee like I fly is of equal importance to the Controller as a 747 loaded with tourists. The reason is that the Controller knows precisely where the airliner is going because he is on a pre-determined instrument flight plan. But the small general aviation plane may be flying under the more relaxed visual flight rules, and in busy airspace, ATC keeps a close watch on the small planes to make sure they don't get in the way of the big ones." The woman was astounded, as the flying public usually are when they find out that just about everything in the sky is in touch with someone somewhere. I believe that the lady came away with a better understanding of general aviation, and also more respect for us GA pilots who are up there chasing clients or hamburgers. I closed the conversation by trying to emphasize that GA pilots have a very high level of training, and are not that far removed from the two professional pilots commanding the flight deck of an airliner. Except for a long list of regulations and of course a couple of advances ratings, I said, "pilots are pilots. We all fly machines that react to control inputs identically, all have generally the same types of systems, and occupy the same airspace for much of the time. Some just fly higher and faster than others." The fact that Average Joe, Jane and their kids are unaware that we GA pilots need to be highly-trained to guarantee the safe outcome of a flight into busy airspace cannot be overstated. As pilots, we need to be on the lookout every day for opportunities to talk up GA in a positive way. Your children's school is a great place to speak about flying, and many service clubs like Rotary or business clubs would welcome a presentation to explain why and how we fly. And maybe – just maybe – we might just spark a fire in one audience member so they seek out a flight school at that little patch on the edge of town and start living their lifelong dream to fly. If that happens, our time spent as a GA advocate will be more than worth it. And if you think you are too shy to stand up in front of a large audience and speak with confidence and flair, then you need to join Toastmasters International like I did almost 5 years ago. I promise you that anyone can benefit from their once-a-week meetings, and in no time, you'll be able to speak in public without breaking a sweat. 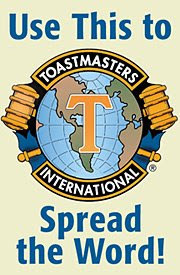 You can find out more about what Toastmasters can do for you here, and find a local club here. Bottom line: If 1,000 GA pilots joined a Toastmasters club somewhere and learned how to address any audience on the positive aspects of flying, we'd have a whole new crop of ambassadors out there on the front lines singing our praise. And THAT would be a great thing.